Find one of the small holes in the side of the closed CD case. Put the tip of your scissors (or pliers) into the hole and carefully break off a 1/3-in (1-cm) long piece near the middle of one of the sides of the case. It's okay if the hole is not even. After removing this piece of plastic from the CD case, you may remove your goggles. Carefully tape all four sides of the case closed except where you made the enlarged hole with the scissors (see below). Lay out your newspaper on a table. Carefully mix approximately equal amounts of sand and salt (about 1/4 cup each) in the plastic bag. Seal the top of the bag. Tilt the bag so your sand–salt mixture is concentrated in one corner, then cut a small hole in the opposite corner, making sure nothing leaks out. Insert the straw 1cm into the hole (see below, at left), leaving about 3 cm sticking out, and then secure the straw in place with tape (see below, at right). Place the CD case on an even surface so the hole on the edge of the case is facing up and one of the flat sides of the case is facing you. Insert the straw into the hole and carefully pour the sand–salt mixture into the case. Observe what happens. Without further shaking or tilting the assembly, look at the back side of the CD case. Is there any difference in the salt–sand pattern when seen from the front versus the back? You may find that the front looks blacker and the back looks whiter, or vice-versa. To further investigate this effect, place a small piece of tape over the hole and hold the CD case so that it lies flat. Gently shake with a combined vertical and horizontal motion for a few seconds. After shaking, the top portion of the mixture (that you are looking down at) should now be largely white—it is composed mostly of salt. Without further shaking or tilting, raise the CD so that you can look at the bottom side. This should be largely black—it is composed mostly of the black (or darker) sand. Turn the whole assembly over and try repeating the process to see if this continues to occur. This black-and-white separation is a manifestation of the Brazil-nut effect. When you poured the salt–sand mixture into the CD case, you should have noticed that it formed an interesting organized pattern of alternating layers of salt and sand. Despite the materials being well combined to start, the two types of particles will always sort themselves like this, as they have different angles of repose—the angle at which the material can no longer support itself. As the materials are deposited on top of the pile, at some angle, one of the materials will collapse on itself. This creates the layers you observe. Within the layers, the salt always ends up on top of the sand when poured into the CD case. This is an example of the Brazil-nut effect as well as the angle of repose of the different materials (see the Going Further section below to calculate the angle of repose). Anyone who has ever opened a can of mixed nuts has experienced the Brazil-nut effect. If you shake a can of mixed nuts, the largest nuts—for example, the Brazil nuts—always end up on top. The smaller nuts fall between the cracks created by the larger nuts. Below is an animated demonstration of the effect, using rice in a plastic container and a red marble. Notice that the marble starts out on top of the pile of rice. If you quickly invert the container and then tip it right side up, the marble will end up under the rice, hidden from view. But shake the container up and down a few times and you'll see the marble begin to rise up through the rice, until finally it is back on top. This effect is also known as granular convection. In a mixture of granulated materials, smaller particles slip between the spaces created beneath the larger particles as the mixture is shaken. In this Snack, the smaller sand particles slip beneath the larger salt particles, leaving a layer of salt on top of each sand layer in the CD case. The different sizes, densities, and colors of the materials in the mixture—in this case black sand and salt—are essential, because materials with different characteristics will have different angles of repose and different rates of granular convection. Pour about 1/4 cup of one type of material—for example, salt—in the center of an open CD case, close it, and tape all four sides so that the material is securely contained within. 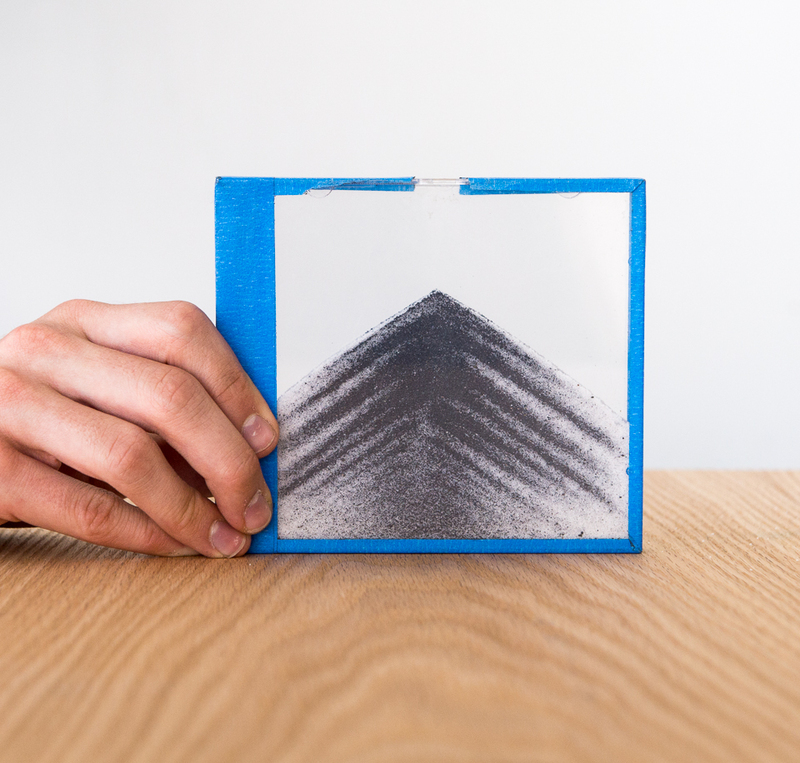 Do the same for your other granular material—for example, black or colored sand—in another CD case. Shake the salt to one side of the CD case, then set it on an adjacent side, allowing the material to “avalanche” down the salt slope (see below). Do the same with the other CD case filled with sand (see below). Compare the slopes of the different materials (see below). Use a protractor to measure the angle of the slope of the material. This is the angle of repose. Follow steps 1–3 above for preparing your first CD case, then repeat with your second CD case. You should end up with two CD cases that each have a small hole on one edge. Tape each of the CD cases closed on all four sides, leaving open only the holes you made. At the edges of the holes, trim the tape with scissors to create openings 1/4 inch (7 mm) in diameter. This is the diameter of an average drinking straw. Be careful: too large or too small a hole may not allow the sorting to work well. Make a sand–salt mixture using 3 level tablespoons (45 mL) of sand and 3 level tablespoons (45 mL) of salt—this is slightly less than the amounts you used in the construction above. Fill one CD case with the sand–salt mixture, using the fill method previously described (or you can use a simple conical funnel made from folded paper or cardstock). In this variation, there's no need to observe the pattern during the initial filling since you will be able to easily make repeated observations once you have completed the assembly. Place the short straw in the hole of this filled CD case and place the second CD case over the straw that is poking out of the first. The straw should be halfway inside of each of the CD cases. Tape the two CD cases together so that the holes line up exactly. 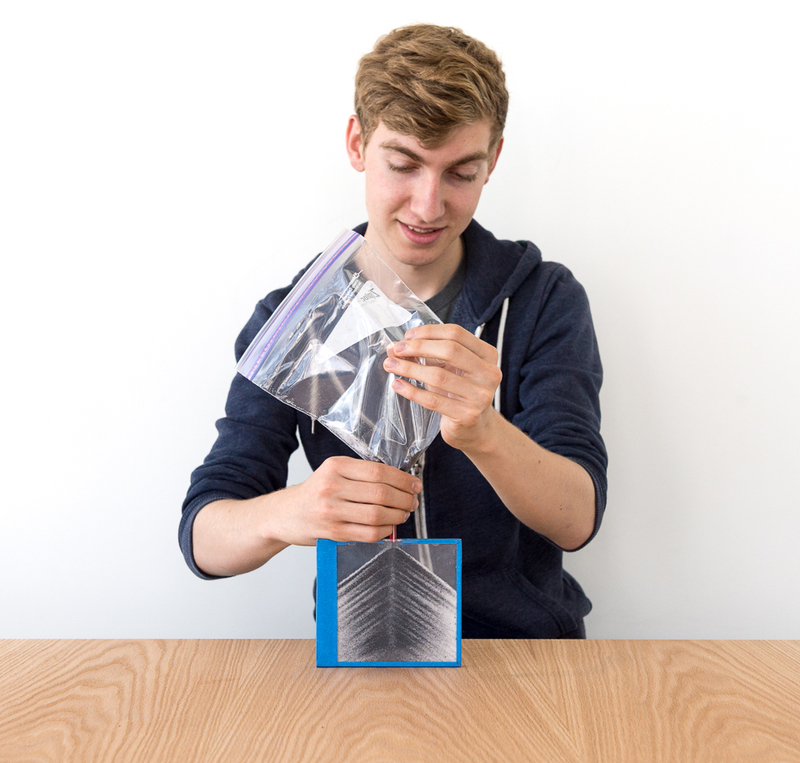 Once the assembly is finished, hold the device vertically so the sand–salt mixture flows into the bottom CD, then turn the whole device over—as you would with an hourglass (see below). Observe the results. Repeat the sorting process as many times as you wish by turning the device upside down after each trial. It can be easy to crack the CD case accidentally while removing the piece from one edge. Gripping the plastic edge with either scissors or pliers and gently twisting will usually break the edge without cracking the flat side of the case. Fineberg, J., “From Cinderella’s Dilemma to Rock Slides,” in Nature, Vol. 386, March 27, 1997. The Avalanche Snack is a version of Eric Thogerson’s Exploratorium exhibit. The original version of this Snack was built by Dr. Ken Brecher during his stay with the Teacher Institute in Summer, 2001. This phenomenon was discovered by one of Ken’s graduate students. Model ground failure in a phenomenon called liquefaction. Boundaries are the gift that keeps on sifting. Does the sand all pile up in the same way?